Russia has rapidly sold off the vast majority of its stash of American debt. Either way, there's little debate over the long-term impact. Russia's selling has not hurt America's ability to borrow money. That's because investors -- particularly life insurers and pension funds that serve aging baby boomers -- have a big appetite for fixed income. Treasury rates quickly descended back below 3% because demand for bonds continued to grow. The limited impact from Russia's selling makes sense. It's not a leading creditor of the United States. China is. Even at Russia's recent peak of $105.7 billion in November 2017, it only ranked as the 15th biggest foreign holder of US debt. China owns about $1.2 trillion -- or roughly 10 times as much as Russia. "It's not particularly alarming," said Guy LeBas, chief fixed income strategist at Janney Capital. "If we had this kind of sell-off from China, this would be a completely different picture," he said. 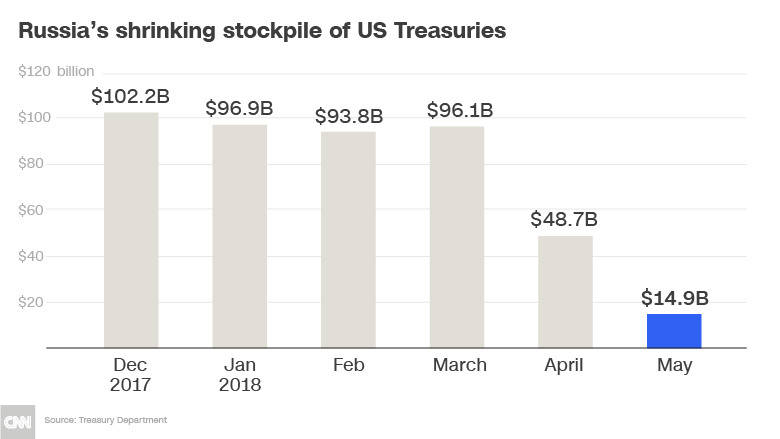 New numbers on foreign ownership of US Treasuries are set to be released on August 15. Russia provided an innocent response to questions about the Treasury sales. "We have increased the share of gold in recent years, almost tenfold in ten years, so we are diversifying the entire structure of currencies," Elvira Nabiullina, the head of Russia's central bank, told state media earlier this month. Nabiullina added that Russia assesses "all the risks: financial economic and geopolitical." Of course, geopolitical tensions between the United States and Russia spiked around the time that its Treasury sales accelerated. In April, the Trump administration imposed tough sanctions on Rusal, the aluminum company founded by one of Vladimir Putin's closest allies. The penalties initially prohibited Americans and people from other countries from doing business with Rusal, which produces 7% of the world's aluminum. Aluminum prices soared on the news. "Rusal's exports were essentially paralyzed. It was a much more vicious kind of sanction than what was previously imposed on Russia," said Jason Bush, an analyst at consulting firm Eurasia Group. "One theory is that this was Russia's revenge for US sanctions," said Bush. If so, the damage was relatively minor given the rebound in the US Treasury market. The Trump administration recently said it's looking into lifting sanctions against Rusal. Another theory is that Moscow feared further US sanctions that could cause its holdings of US debt to be frozen or even seized. "So Russia may have been running for the exit to avoid that threat. That's a more plausible argument," said Bush. In reality, analysts said it was likely a combination of political pressure from the Kremlin and economic arguments that caused Russia's central bank to back away from US Treasuries. The Russia situation underscores long-running concerns that a major US creditor could threaten to hurt America by dumping debt. 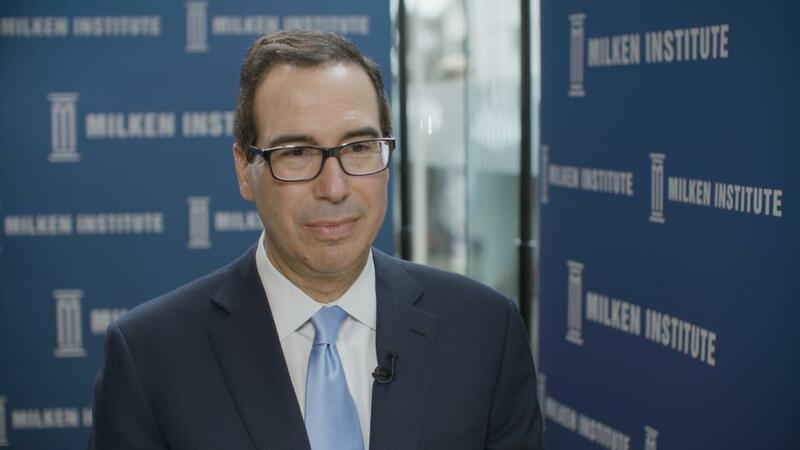 Those worries have been heightened by America's soaring federal budget deficit and the ongoing trade war with China. But analysts question the logic behind this worry. China would struggle to unload that much debt at once -- and its own portfolio would dramatically lose value during such a fire sale.